John Mulholland Local Authority Representative updates the media on Storm Emma at the Department of Agriculture Dublin. Pic: Justin Farrelly. As clean-up operation in the wake of from Storm Emma continues, local authorities are still struggling to free some householders in Wexford, Kildare and Wicklow. But they have been asked to be patient as “as many resources as possible” are being deployed to clear rural roads. Crisis management teams in 15 out of 31 local authorities have now been stood down – but the water network remains a serious concern. Irish Water will delay the implementation of restrictions in the Greater Dublin Area by an hour tonight, until 8pm. Water pressure will be lowered until 6am. Amid complaints that many household found themselves cut off for more longer than expected today, Irish Water’s chief executive Jerry Grant said he is away of the “enormous social impact” the shortages are hainvg. He said 111 million litres have been wiped off the capital reserves since Friday. As a result engineers had to adopt a “crude mechanism” of controlling water usage by simply closing valves. This led to some households losing all their water supply while others suffered minimal impact. Mr Grant said plans are now being made to “refine restrictions to get a more even distribution”. Major issues have also arisen the Fethard area of Tipperary after kerosene spilled into a local waterway and got “sucked up by the pumps” in a water treatment plant. Mr Grant said around 12,000 people will be without water while “a major remediation job” is carried out. It could take up to 10 days to resolve the problem. “It’s a very serious incident,” Mr Grant said. The contaminated water source should should not be used for drinking, drinks made with water, preparing, washing or cooking food, brushing teeth or making ice. Irish Water says that in particular pregnant women should not use this water and it should not be used for making baby formula. Other areas affected by water shortages include parts of Wexford, Wicklow, Cork, Kildare, East Meath and Leitrim. The HSE has not reported a significant spike in the numbers of people showing up with fractures as a results of slips and falls. However, Chief Emergency Management Officer Brendan Lawlor said this remains a concern in the days ahead. Outpatient appointments have resumed in most hospitals but many services are playing catch up. Mr Lawlor said some staff need to be allowed “a period of rest” after working throughout the weather alert and this will now have an impact on rosters. 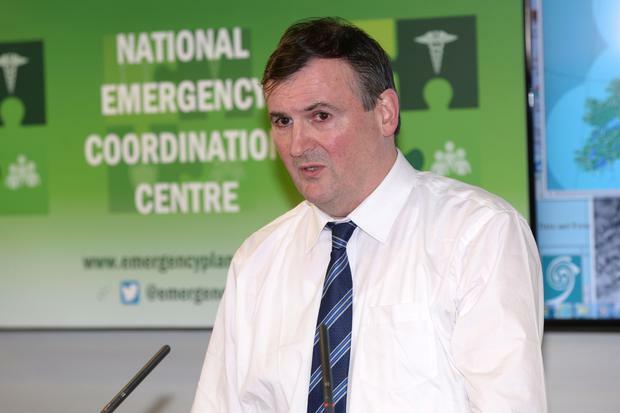 Efforts are also continuing to free up bed capacity in hospitals which had delay discharges as a result of the snow. The chairman on the NECG, Sean Hogan, said this afternoon that the situation is “becoming more spring-like in many parts of the country”. Met Eireann has predicted no weather extremes in the days ahead, although temperatures will be below average for the time of year at between 4 to 8 degrees.